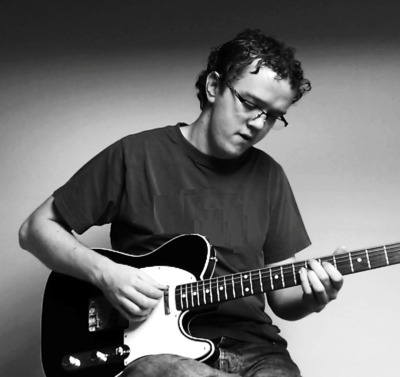 In this edition of the RGT Guitar Tutor Interview Series, we are sitting down with Yorkshire jazz guitarist and guitar tutor Jamie Holroyd. Having just begin his teaching career, after receiving his jazz guitar performance diploma from the prestigious Leeds College of Music, Jamie has already built an international reputation as one of the top up and coming guitar teachers both online and in person. We recently caught up with Jamie to talk about his first guitar tutor teaching position, how the RGT Syllabus has helped him in his first teaching job, and his use of Social Media Tactics to help build his online and in-person teaching business. You can find out more about Jamie, his performance and teaching careers, please visit the Jamie Holroyd Homepage, Jamie’s Facebook Page and Jamie’s Twitter Page. RGT: How did you become aware of the RGT, and why do you choose to encourage your students to take RGT guitar exams? Jamie Holroyd: I became aware of the RGT about 18 months ago through my good friend and teacher at the time, Matt Warnock. After attending the 2012 conference, and checking out the variety and quality of the grades they offered, I was sold. I choose to use the RGT guitar books with my students because they are the best books out there for balancing all of the most important elements of learning the guitar. The other books I looked at were either not challenging enough, too focused on technique, or didn’t have proper songs for students to learn. RGT: You have recently started your first teaching position at RAW Studios. How did you prepare for your first guitar teaching position, and how do you see the RGT syllabus fitting into your lesson plans? Jamie Holroyd: I prepared for the teaching position by sitting in with the guitar tutor I was replacing, and took notes of how each student learnt and what their goals were so that I could plan personalized lessons for them. The RGT syllabus fits into my teaching well because it contains great repertoire, backing tracks, and technical resources. The grade books are also an ideal way for me, the student, and their parents to keep track of the student’s progress. RGT: As well as teaching in person, you do a lot of teaching online through Skype. Can you tell us how you got started with online lessons, and how it has grown since you first started? Jamie Holroyd: About half way through my second year at Leeds College of Music the dreadful and overwhelming realization hit me – that I had to somehow make a living with a jazz degree in about 12 months – and that’s when I started Jamie Holroyd Guitar. The first few lessons were initially written for a college assignment, but due to the positive feedback and encouragement I received I decided to continue publishing new articles and recording YouTube videos with every bit of spare time I had, and I slowly started to get more enquires for guitar lessons than ever before. Fast forward 18 months and I have published over 100 articles, two in depth eBooks and taught in over 15 different countries. There’s still a long way to go yet and it’s a lot of work, but I am thoroughly enjoying every minute of it. RGT: Having released two ebooks in the past year. Tell us how that process came about and has that enhanced your in-person and online teaching career. Jamie Holroyd: During the summer of 2012 I wanted to get my website to the next level before returning back to LCM for my final year, so I set myself the challenge of publishing a brand new article for 30 days straight, which 6 months later turned into my first eBook ’30 Days to Better Jazz Guitar Comping’. No one asked for refund and everyone who bought it wanted me to write a follow up book that focused on single line soloing, and that’s when I decided to publish ‘Introduction to Jazz Guitar Improvisation’ two months ago. The eBooks have help helped me recruit new students and always make a good impression at interviews, especially the first one because I somehow released while still being at college. RGT: You have an active Facebook, Twitter and YouTube channel. Can you tell us how you use social networking to grow your teaching studio? Jamie Holroyd: Although each of these platforms is essential for the 21st century guitar teacher, by far the most effective one for growing my teaching studio has been YouTube. My YouTube channel has helped me connect with students across the world and I’ve even had in-person student’s travel from different parts of England for jazz guitar lessons. I recently published an article that explains how I use YouTube for the RGT Blog, which you can read by clicking here. RGT: What has been the biggest reward and challenge so far in running your online teaching website jamieholroydguitar.com? Jamie Holroyd: The biggest challenge was probably making it through the first 6 months, because I got little to no money and didn’t think all the work I was doing would pay off. But, persevering through this ultimately enabled me to get my first teaching gig, so that’s been a big reward for sure. The aspect to online teaching that I enjoy the most, is that I make most of my living from doing something that I enjoy, which is teaching and playing jazz guitar. RGT: As someone that has a degree in jazz guitar from the Leeds College of Music, do you see yourself continuing to pursue your musical education, or focus on teaching and performing for now? Jamie Holroyd: That’s a great question which I have been swaying on for a while now. The thing is, I have been asked about my online teaching business in every job interview I’ve ever had where as my degree seldom gets mentioned, even though it took 3 years to get. In fact, some good friends of mine are amazing musicians but don’t have a website and didn’t get interviews for the jobs we’ve both applied for, so I’m not sure what difference another qualification would make. That being said, I would like to study the FLCM Jazz Guitar Diploma Qualification and maybe a business degree for my own personal interests, so we’ll see. RGT: Entering into your first term teaching private guitar lessons, what do you see as the biggest challenge you’ll face, and how are you preparing to deal with this challenge beforehand. Jamie Holroyd: Some days I can teach up to 7 or 8 back to back guitar lessons, so keeping things fresh for each student can be a challenge. So, I remind myself that even though this might be the 20th student I’ve taught that week, this is the students first and only lesson all week, so I try to keep each lesson focused and exciting for them. RGT: If you had one piece of advice for other players that are just beginning their first teaching job what would it be? Jamie Holroyd: Get to know each student and teach them what they want to learn. This will sometimes mean that you need to ditch a lesson plan completely if the student has a question or brings in a song for you to transcribe. But adapting your lessons to suit the student will keep them motivated in learning the guitar. This entry was posted in RGT Teacher Interviews and tagged RGT Guitar Tutor by Alan. Bookmark the permalink.